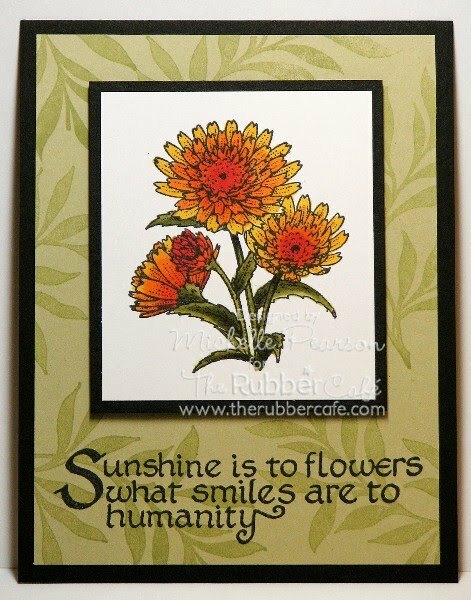 Well its beautiful here in Sunny San Diego ... and I am preparing to teach at Stamping Details this week along with the Scrapbook Expo . I have never made so made kits in my life . 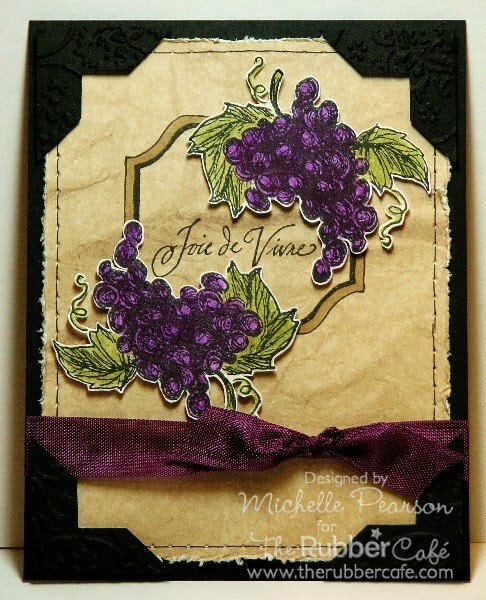 So as I was procrastinating today I went over to Michelle's blog and she had a really cute card on her blog that she made using some flowers . Well it inspired me and I went off on my own little voyage .. Sometimes we get stuck only using stamps that are in the sets that we buy them with. Well this card is using a variety of stamps paired together that you would not normally put together . I forgot to add I did not use Copic Markers . I used colored pencils for the first time in two years.Sometimes its nice use other things. This set has been on my mind this week....and this is what I came up with! I used three stamps from the Bon Appetit set. I colored the frame with Copic E43. For the grapes and leaves I used Prismacolor Pencils PC988 Marine Green and PC951 Dark Purple, which I blended with Gamsol. The ribbon is vintage. 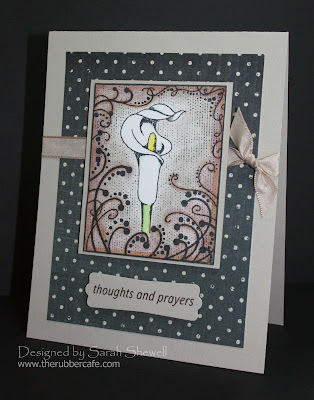 I made this sympathy card for a friend who just love her father. 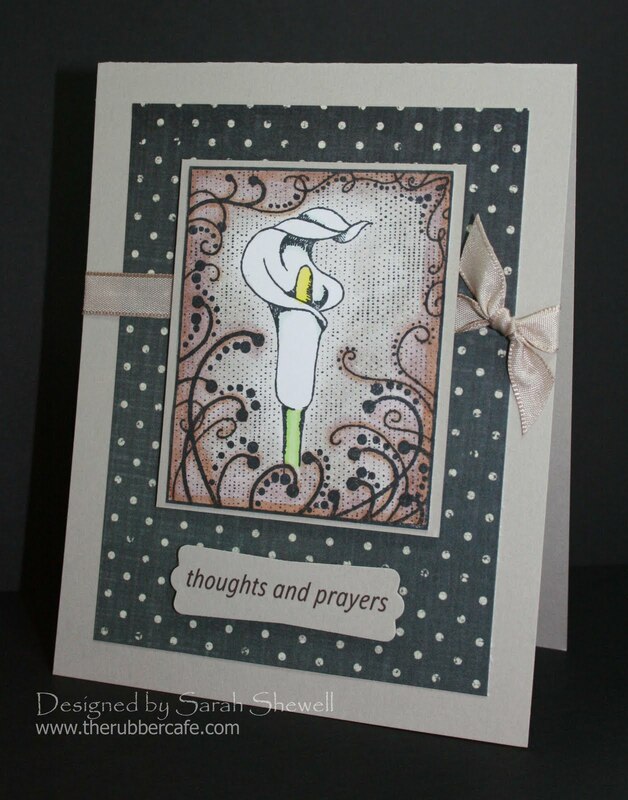 The calla lily image just looks soothing and peaceful to me so it was the perfect fit. I've colored the background in with a selection of warm gray and brown copic markers. The sentiment was printed directly onto my cardstock and then punched. Thanks for looking! Happy Tuesday all. Yesterday my husband had his last birthday...so he says. He said getting old is for the physically fit. Well...in dog years...he'd be dead! We had a great afternoon yesterday. Two cakes, several dogs and a few family members all came to celebrate his birthday. Later we rode up to a local casino and enjoyed a beautiful room in their hotel overlooking a stunning garden and mini waterfalls. This morning he let me indulge myself and we had breakfast in bed. I let him know…that if he wasn't having any more birthdays…we could just stay twice as long on my birthday. Being that I knew there would be several dogs at his little party…I thought this card would be perfect. Using the brand new set from The Rubber Café "Birthdays & Balloons", I made a fun gate fold card that reminded him…he was still among the living. Starting with a sheet of cream cardstock 6" x 10", I scored at 2 ½" & 7 ½", folded each gate in and decorated. The Nestabilities from Spellbinder are great for layered mats. Adding just a touch of brown brings out the blues and greens in this card. The dogs in this set are toooo cute to pass up. The sentiments are very fun and funny. This is a great set for the dog lover, just the fun birthday or any other dog loving occasion. I also have had coffee on my brain! The curled mug is a fun image for the coffee-lovers in your life! I prefer mine frozen with gobs of sugar....but I still like the smell and idea of hot coffee!! I have a clean and simple card design, perfect for the men in your life! I colored the image with Copic Markers. I doodled around the image and matted it, layering it over some coordinating ribbon for contrast. I used the main image stamp as a background stamp as well...it really pulls the card together and gives the appearance of designer paper. I love the font of this happy birthday outline image as well, very versatile, and you can coordinate it with your card's scheme! 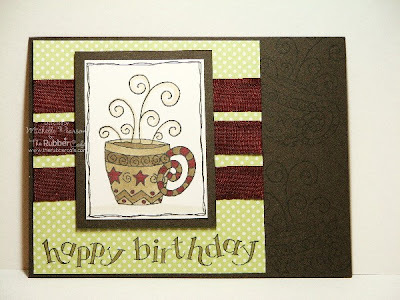 I drew inspiration from this designer paper to create an Asian themed card. 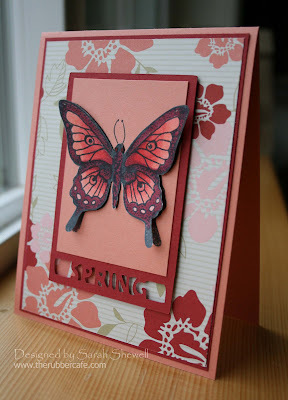 I created the spring tag with my cricut which made the perfect place for the Highwing Butterfly to spread it's wings. I've colored in the wings with three shades of orange and red copics and highlighted a few places with a clear spica pen. Thank you for looking and enjoy this beautiful spring day! How about a cup of coffee??? I am a little late with my posting, sorry for that. Sometimes life is CRAZY! And when it is, nothing is better than to calm down with a hot cup of coffee or a nice cup of tea. I prefer coffee! The newest toy for my craftroom is a Cricut. So far I haven't figured out how to use it very well but in my botched attempts I created this large leaf pattern. Since I live in the Northwest it looked like kelp to me, and the perfect background for the cutest little worm I've ever seen. 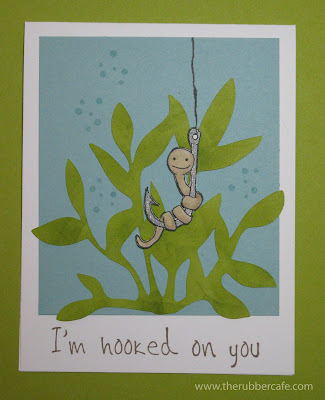 I used the I'm Hooked on You set to create this underwater scene. The little guy is colored in with copics and the hook has a bit of shimmer from a gray spica pen. You ask we Listen ... What are you doing for National Scrapbook Day ? Well we are going to be at the Del Mar Fair Grounds with Scrapbook Expo April 30 and May 1st . The San Diego show is one of my favorite shows ... I get to see all my local friends ... most of you know I am never home . So whats in store for National Scrapbook Day week-end ... Scrapbook Expo is putting on some cool crops each day and Night ....and tons of Workshops ... Have you ever wanted to take a class of nothing but Basic Grey , SEI , GCD studios ?This is your time to learn techniques from some of the leaders in the industry in scrapbooking, papercrafts and rubber stamping . Do you ever sit and wonder.... What am I going to buy for her /him?? Birthdays are fast approaching and it looks like you are going to go with your old stand by GIFT CARD. What if you could give the gift card in a package that would make everyone say "How did she do that"? In this class you are going to learn how to make a 3-D gift card holder to knock everyone's socks off.... Even your own when you look at what you have created. When you leave this class you are going to be bubbling over with ideas.... of what you can use of your own craft supplies to re-create the project over and over again. We are going to use Cosmo Cricket paper, Petaloo Flowers, ribbon, adhesive, glitter and a whole lot more ..... Retail value of Kit $30.00. *There will be a prize drawing for class participants* Please bring hot glue gun & sticks, fabric tac, and scissors. Soon it will come to pass that my son will be graduating from high school. An honor student, an athlete and a musician, he will be walking with his class and I will be the teary-eyed mom watching from the stands waiting for the perfect picture to remember it all. I'm sure that I'm not the only mom in the stands that will be all teared up, but I will feel like the proudest mom on the planet. When literature came in the mail about grad announcements, I opened it all and reviewed the information. With time running out, I almost went for the store bought versions...but I just couldn't see spending all that time and money and not getting what I want (cause...it's all about me...not him...right?). I finally decided I would put together something simple...I thought...and leave it at that. As it turns out...this wasn't that difficult. The school mascot is a soaring eagle. I went with this wonderful stamp from The Rubber Cafe. Using the Storybook cartridge, the Cricut was a great help for the numbers. The 0's had some little hook at the top and my son wouldn't go for that...so after the die cutting was finished we sat and trimmed off each hook. Since he was the one who didn't like it, I made him do most of the trimming. I really enjoyed this process. I let my son pick the pictures and I didn't work to make it so complicated that it would be hard to finish in time. He's a handsome, well rounded kid and I couldn't be more proud to share him with you. Hi folks! Hope you’ve had a wonderful weekend and a lovely Easter Holliday for you who celebrate that. 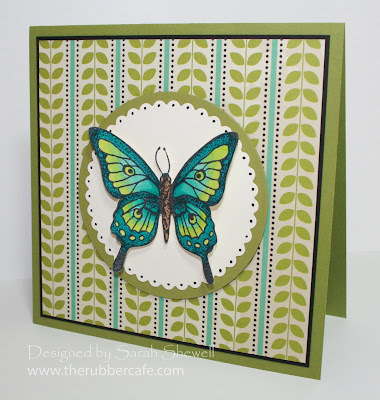 I’m back with another card with the most awesome butterfly – the Large Highwing Butterfly. I found this gorgeous quilt pattern challenge and simply HAD to give it a go. I used my Green at Heart paper pad and got to it. Well, I don’t know about the pattern… Hehee, but the butterfly is magnificent in any surrounding. I tell ya, it’s even more fantastic in real life! This time, I clear embossed the butterfly on white cardstock, and simply inked it up with distress ink, and wiped it off with a baby wipe. Done. Today's card features the gorgeous Shasta daisy! I love flowers....so this one just popped together so easily. I colored the Shasta Daisy with Copic Markers. (R27, YR07, YR16, Y17) The greens are Studio2 pens, since I don't own these shades of Copics....YET! I stamped my own background using a Colorbox Fluid Chalk Inkpad in Olive Pastel, stamping the leafy image off once for a more subtle look. This is an image I can see grabbing often, very versatile! Finally I stamped the verse in black for a simple, yet effective look. If you are interested in the verse or Solid Leaf Spray stamp, please contact Melissa. They are in the process of adding all of their images to the site, and these don't appear to be up yet. Here is a simple card that lets this beautiful butterfly image shine. I've blended blue and green copics to color him in then mounted against a simple vanilla scalloped circle. I picked up the dots from the paper by October Afternoon with a black skaura glaze pen in each scallop. It adds shine and slight dimension.